Coll. No. 1482, 29 June 2016, characters observed: Perennial herb, caulescent, 8 to 15 cm., glabrous below, becoming glandular in inflorescence, but not hairy; Leaves, opposite, 20 mm. × 1.8 mm. wide, narrowly oblanceolate, reduced above; Inflorescence, 6-8 flowers per stem, somewhat one-sided; Pedicel, leafy, 4-9 mm. ; Calyx, tube 1.0-1.5 mm. + lobes 4.0-5.5 mm., green to dark green with tinges of purple, chartaceous scalloped margins; Flowers, tube, 12 mm. + lobes 5-6 mm. × 8-9 mm., blue throughout, or yellow tube with blue lobes; Staminode, hairy at tip; Stamens, just reaching orifice of corolla, Anther, sacs, 1.6 mm. glabrous. Field Notes: Coll. No. 1482, 29 Jun 2016. 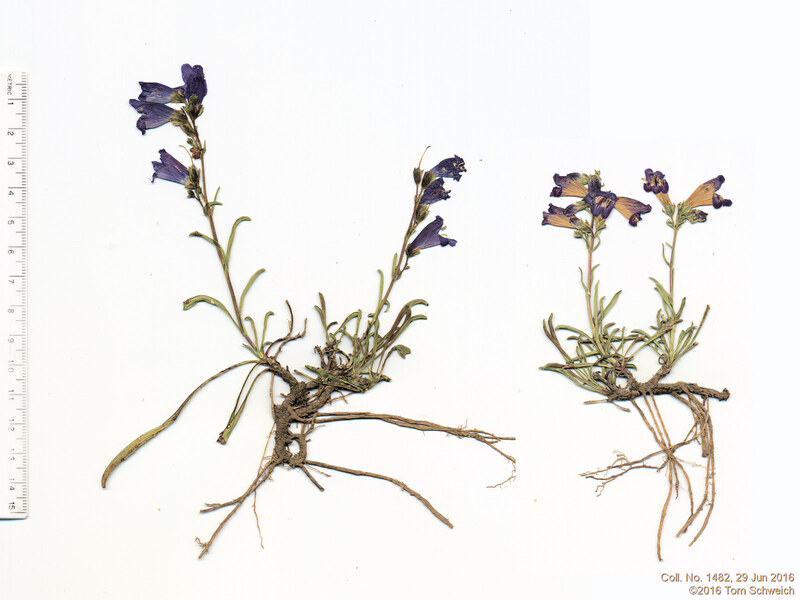 Other photos about Species or Plantaginaceae Penstemon hallii.